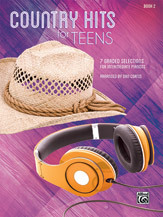 Country Hits for Teens presents carefully-leveled, accessible arrangements of current country music for the teenage pianist. This series provides students with the opportunity to develop their technique and musicianship while performing popular pieces by their favorite country recording artists. Titles: 19 You + Me (Dan + Shay) * American Honey (Lady Antebellum) * Dancin' Away with My Heart (Lady Antebellum) * Good in Goodbye (Carrie Underwood) * Let Me Down Easy (Billy Currington) * Mama's Song (Carrie Underwood) * No Hurry (Zac Brown Band).